Conventional wet transfers are cumbersome, require experience and a great deal of time spent on consumable preparation. The transfer times usually vary from 1 hour to overnight. With eBlot fast wet transfer system, achieve excellent transfer efficiency without sacrificing speed. eBlot® L1 allows fast and efficient transfer of 1 or 2 mini gels at a time. The setup takes less than 2 minutes and avoids the mess of a traditional wet transfer with our easy to assemble dry sponge sandwich. Our customizable protocols allows optimal flexibility for your research. The unit comes with standard protocols designed to transfer larger proteins (up to 400kD) or opt for a shorter transfer time for smaller size proteins (up to 100kD). Comparative blotting efficiency with various transfer systems. Three different proteins were transferred on to PVDF membranes using traditional wet transfer, iBlot, Trans-Blot, and GenScript's eBlot L1. 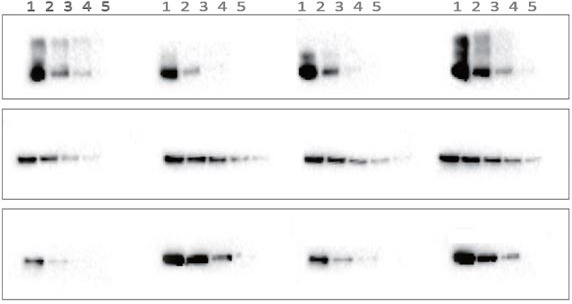 The quantities of proteins loaded ranged from 1.25 µg- 20 µg for EGFR, 7.8 ng- 125 ng for Taq, and 0.6 µg- 10µg for GAPDH. For all three proteins, the eBlot® L1 offered superior transfer efficiency compared to other systems. With its high efficiency of transfer, protein concentrations as low as 7 ng for Taq (lane 5), and as high as 20 µg for EGFR(lane 1) could be clearly visualized.